What do you get the driver who has everything? Why not pull out all the stops and get something they’d NEVER expect. We’re approaching Christmas. You’re wondering what to get that passionate driver in your family. Wonder no further! We’ve compiled a few of the latest, greatest, quirky car gifts to make your life just that little bit easier when buying xmas gifts for the festive period. Top of the list this year for any motoring enthusiast is almost definitely their very own track day experience. These driving days offer any wannabe lap racer the opportunity to take their favourite supercars out for a spin around a real race track. As far as gifts for car lovers go, with a broad range of locations and vehicles available to choose from - track days can provide the perfect, unexpected surprise - capable of an unforgettable day. Next on the list are unisex, ‘Aviator Glasses’. These special night-sight specs allow you to effortlessly reduce the glare of oncoming headlights and streetlights while driving in the dark, making them the perfect gift for any driver that feels less confident on the road at night. What’s more – aviators are effective in flat-light or overcast conditions and even help to prevent users’ eye fatigue. So whether your loved one is regularly driving home after a long day at work or driving long distance for large periods of time – these useful, little beauties go a long way in ensuring comfort and safety across journeys. On the other hand, if the ultimate, gimmickry stocking filler is what you’re after – look no further than car accessories and your very own ‘DipClip’. In other words, one of the most millennial inventions to have hit the market this year, the vital sauce holder, designed for the dunking of chicken nuggets and fries. Capable of clipping onto almost any interior car vent, this indispensable invention keeps sauce immobile while driving, allowing you to dip snacks, on the move. What more could you want? Well, you could want your car to smell great and if you do – ‘Fresh Faces’ are the best, weird choice of personalised car accessory available. If the DipClip isn’t something you see your loved one using and you’re stuck for ideas, how about printing your face onto a car air freshener for them, instead? Take a selfie, zoom in nice and close, pull your wackiest facial expression and choose from five different sensual fragrances – which ever one suits you best. Make sure your loved one is never riding solo and always be in the car with them. With such a large spectrum of gifts and price range to choose from, the car industry never disappoints when you’re pressed for time and looking for one of those different, last minute presents. 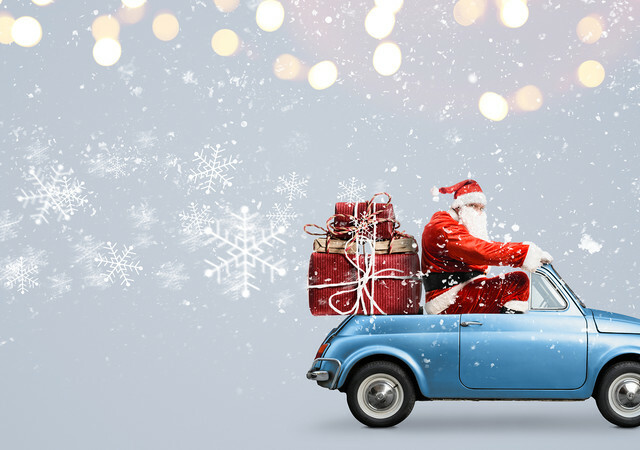 Or if you're really pushing the boat out, you could buy your loved one their dream car at findandfundmycar.com to make it a Christmas they will never forget!